Hey everyone! Check this out on YouTube! I play all instruments myself. 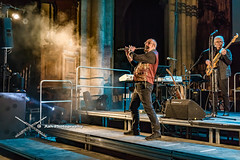 All instruments played by Geo Ian Anderson, please hire me! I know all of your songs, I'll work for next to nothing, and I promise I'll behave! I'll give John O'Hara a run for his money. Florian... I'm not so sure. He's pretty darn good! ...But for real, Ian. I'm your biggest fan. I'll work for a half-eaten sleeve of generic crackers. I posted this last night, but for some reason, it was gone this morning (as well as every other post I've ever made. It's as though my profile was deleted after I posted the video or something). Anyways, I'm a long-time reader of this forum (only posted 5 times or something). I'm 28, from Pittsburgh, PA, and I'm a huge fan of Ian Anderson. I've followed him across the country more than once. I've been playing music since I was about 5 have had a ton of home Tull recordings just hanging out on my computer. I figured it was time for me to start redoing it, bit-by-bit, and uploading it. I'm glad that you like this section of TAAB. Stay tuned... there is much more to come! Please, no A Passion Play requests. I've already recorded it and I have NO video. I'm not redoing it or miming to it! It's too complicated! Ian, hire me. I'll do bass! (Does anyone have any idea as to what could've happened to my original post and my old profile? It's gone! I swear, I was just on and posting last night). Am I breaking the Terms of Service for posting videos in the "Tribute Band" category... I know I'm not a band. If so, my apologies! (as well as every other post I've ever made. It's as though my profile was deleted after I posted the video or something). Anyways, I'm a long-time reader of this forum (only posted 5 times or something). I'm 28, from Pittsburgh, PA, and I'm a huge fan of Ian Anderson. (Does anyone have any idea as to what could've happened to my original post and my old profile? It's gone! I swear, I was just on and posting last night). I know I'm not a band. If so, my apologies! I'm sure an explanation will be provided. The rules on threads are just a way to organize topics in general. If things get deleted it would be over abusive language or something serious. In the past a few former members became insulting towards others in a very strange way. They pretended to come from places that did not match their internet address. Your video is superb! Can you play "El Niño" ? Years ago, I was part of the Yahoo Tull thing where we all voted for the best Tull song of all time. I was also briefly on the old old forums (I was like 15 or something!) There was so much trolling that I had to leave. I think that there was someone called "Jethro Dull", and they kept talking crap on Ian's voice. I remember there being a lady called "Blue", and she was very nice! I'm happy to now be a part of this great forum. I've always appreciated Tull. Ian is a genius. For years, I've been trying to figure out all of the parts to the Tull catalog. It's my reason for living! I've been in a few bands before, but we never did any Tull. I was actually a "George Harrison" in a few Beatles tribute bands. Toured the USA. Played with some of the greats. But I got really sick of the poor musicianship and drama. I had to leave. Even now, I'm constantly looking to start up a band. I'm from Pittsburgh, and it's a heavy metal city. Well, it's more of a death metal/screaming about everything kind of scene. I can't find like minded musicians who actually possess the abilities to pull off the Tull stuff. Especially in my age group (I'm 28.) The best I could find was a drummer that could handle the prog Tull stuff, but he was in his 60s (not a problem), and not in good health (quite a problem)! So I'm currently not in a band. I'm either at work, or I'm at home working on learning the Tull catalog. Ok... enough about me! But yeah, if anyone can actually handle the repertoire and is willing, let's start something up! Of course! Is that a request? I gotta tell you that I need a new flute. I have 5 flutes in various stages of repair. I attempted to do the flute in my TAAB video, but the pads were so worn that it was just a bunch of squeaks and mechanical key noise! I had to play keyboard flutes instead! But yeah, El Nino isn't too tough. A Passion Play was the toughest stuff to tackle. Mostly the keys. From the "Foot of our Stairs" section thru to the end, it is just insane! The bass on the whole "Songs from the Wood" album is masterful! Tunes like "Cup of Wonder" are way more complicated than one might think! I've never attempted the "Divinities" album, minus just doing the flute for "In the Grip of Stronger Stuff" and "In Maternal Grace". As much as I respect John O'Hara, I must say that his parts are the easiest of the whole Tull catalog. And his interpretations of previous keyboard parts are a bit simple. Now Andrew Giddings... he is second only to John Evan. Also, in full disclosure, I've never taken a lesson in my life. SO my input could totally be wayyyy off mark. Take all that I say with a grain of salt. Hi geostrehl and welcome to the JT Forum. The only thing I can think that has happened is that you may have signed up on a couple of other sites, both hosted by proboards, that purport to be about Jethro Tull etc but both seem to be quite dormant at the present time and unfortunately the admins here at the Forum have no connection with either of the two sites. According to the security log, no posts of yours have been deleted from the Forum. In any case, and back to your original post, it's a great video and please keep them coming as I'm sure there will be a lot of members interested in hearing your efforts. I gotta tell you that I need a new flute. I have 5 flutes in various stages of repair. a bunch of squeaks and mechanical key noise! I had to play keyboard flutes instead! But yeah, El Nino isn't too tough. I have and continue to request this tune since 1999 when I first asked Martin Barre. He said it was not his decision at the time so I brought it up again last December in Asheville. I said "Martin, just play the riffs or any part you wish as an instrumental... PLEASE !!!" Thank you Maddog. I just went back through months and months in my history folder. It was on "The Jethro Tull Board". The one with that "Pied Piper" person posting around a lot. It was indeed one of the other Tull Proboards. Please forgive me for the confusion! I wondered why the other one seemed pretty dead! Back in 2003, I asked Doane Perry to please ask Ian about putting "A Gift of Roses" into the setlist. This was backstage at the (now closed) Chevrolet Amphitheater at Station Square in Pittsburgh. Doane said, "I've asked Ian about that song, but he doesn't seem to want to play it. It's a great song!" Excellent video and you certainly are very talented. Fantastic, you are an amazing talent. Hi Geostrehl - your rendition of Thick as a Brick part 1 is absolutely amazing! I have tremendous respect for your skills - and your taste in music! I remember when Thick as a Brick was first played on the radio in the spring of 1972 my friends and I (16 at the time) listened in rapt attention as we were already Tull fans. 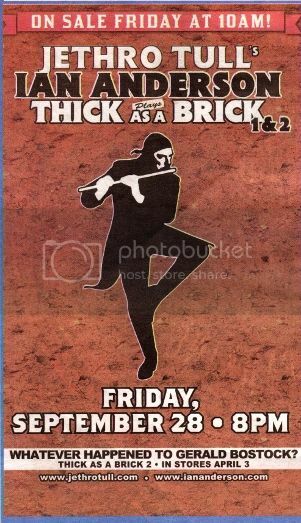 A couple of months later we all saw Tull on the Thick as a Brick tour, and to this day it remains my favorite concert of all time, and Thick as a Brick my favorite piece of music. To hear you play it so perfectly and with such passion has really touched me. I didn't know that anyone under about 50 years old had ever heard TAAB much less loved it enough to learn to play it perfectly! Thank you so much and I can't wait to hear more. It's a pleasure to hear your videos and a Big Welcome to the Forum. You are very talented, dedicated and enthusiastic. Are you doing this full time? Reason I ask is my son who's a little bit younger than you eats, breathes and sleeps music and is heading off to London to study music and sound production. Tell us more about how you first heard Tull and what your favourite songs/lyrics/concerts are? TAAB 1&2 in Asheville, NC. Rubbing Elbows in Easton, PA would be number 2. Thanks for the warm reception! Tull fans are the best! Many thanks for sharing geostrahle - I enjoyed reading that! Tull fans are the best and it's great to link up and know that people are doing all sorts of things around the world yet share a love of Ian's music and showing it either by being inspired to play or just turn to it at different times in their day and lives. Tull is usually the last thing I think about before going to sleep, as well as one of the first things that I think about when waking up. Isn't it crazy how music can have such an impact on us? I'm a melody guy. I mean, technical difficulty is great and all, but if it doesn't have a tune that you want to hum and whistle all day, what's the point? That is where Ian's writing really shines. Also, you can listen to random Tull tunes and always find something new. Just last night, I was listening to "Out of the Noise" from Roots to Branches. I was really paying attention to Andrew Giddings' keyboard work. Wow! Now I can't get it out of my head! Even the worst Tull is (usually) head and shoulders above most other music. We're lucky that Ian has given us so much material to listen to! There is a seemingly endless supply of material to entertain us. Now if some pro-shot footage from '72-'73 would show up, THAT would be a treat! I'm glad to have been so warmly welcomed into this Tull community, and I'm really looking forward to frequenting this place. Hi G. Nice to hear such Tullish enthusium. I love what you are saying about always finding little things in Ians songs. That reminds me of one. I listened to "Ladies" for about 20 years when I got the little joke Ian included in the song. Anyone else get it? No one has ever mentioned it here. Are you talking about "Auld Lang Syne" dubbed in on sax at the end??? If so, I thought that I was the only one that caught that! Please feel free to add to any threads or to start one - that's what we're all about! It maybe cheaper to get one of the flutes fixed .Ian Mclaughlan does great work and I've used him in the past www.headjoints.co.uk/. As does All Flutes Plus www.allflutesplus.com/repairs where Ian buy's his flutes.